In my project, I made it so the font for my adjective stood out by being large and then I made my quote smaller to go with the adjective/heading. I made the font small enough so there would be space in the margins, but not too small so you can't read the words. There is a lot of space in the margins so it can be wide open and not so together for it to be easier to read. The contrast between the background and the blue text is just enough so you can read it without getting lost. The turquoise texts pops out from the dark green background. I chose the colors so that they would be legible. I chose the font "traveling type writer" so you can easily read it. For each of the pieces of texts I decided to put a stroke and a drop shadow for the text to pop a little more. 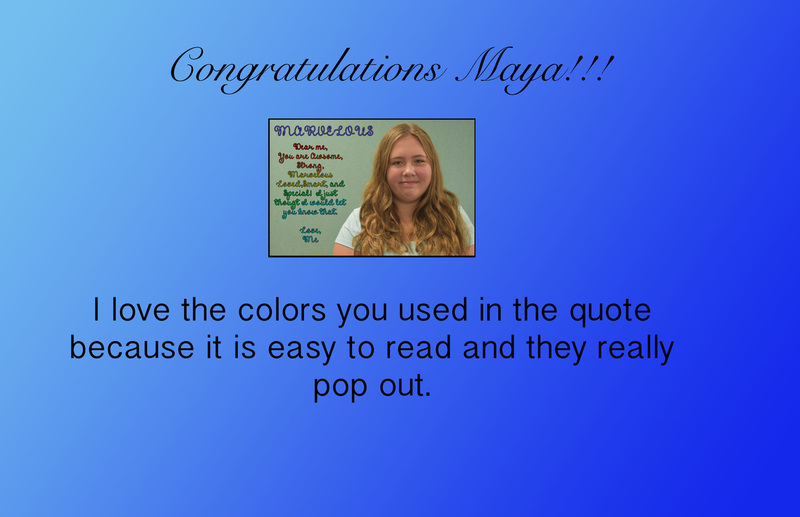 I chose the adjective "successful" and the quote because I think the quote runs smoothly with the meaning of the adjective that I want to project. To design this awards I played around with the background using the gradient tool. I also played around with the fonts and found the right font that went with the photo and background. I also worked on centering the text were I expanded what I liked about her project.I also wanted to make sure that you could really see the text so I made the text black so the contrast was strong between the black and light blue but then the contrast got lighter between the black and the darker blue. To design this award I played around a lot with the fonts and I knew I wanted the "congratulations" yo be a different font than "James Caldwell". I used the background color to contract a lot with the font color which was black, I wanted to make sure there was enough margin to be able to read everything clearly. I wanted to also make sure that everything was centered as possible because i wanted it to look neat. In my photo shop project I decided to work on the idea of no judging someone from how they look like but actually judge them for their personality. For the text I used the black on the brick and the turquoise to pop out. I decided to take a picture in the breeze way and then on photoshop I decided to erase out everything on the picture except my self. On the left their is a picture of me crouching down meaning someone judging someone else from their looks and then that person being shy. Then I took a picture of me standing proud and that means that the person judging the other by their personality and accepting them. The four bolded words I have on the sides are explaining what that person is feeling. I really enjoyed using photoshop because their where so many different ways to go with this project and there are a big selection of tools. I think that photoshop is very easy to use and ver fun to use too! When I made my futuristic houses/cities I made futuristic little things but then I also made a mansion made out of glass from an island. I would have maybe used the same world do put my two houses in and I could have built one in one island and the other in the other. I enjoyed working on it because it was something I looked forward to doing each day I came to school. I really think my house in the second world was really fun to make but I could have made it more futuristic in the inside. When I made my wood carving a drew out my design and traced in black sharpie that parts were I wanted it to carve out. I took a picture on a website called easel and then connected the computer to the machine so the machine could read the design. I then typed in the computer 1/6 so that the carver would not carve all the way through. After the hearts and the word printed out a added in a hole in the middle and erased the 1/6 because I wanted it to carve in the whole design. I'm proudest of how much I have learned this year in photoshop. I learned how to use many tools and how to use them. For example in my Spanish for Spanish Speakers class my teacher was using a slide show and she had two different colors of text in one paragraph and I told her that Ms. Kushner would not approve of her color choices because you need to have contrast between the colors meaning that you have to have them not looking alike so it is easy to read them. I am also proud of the ability for me to make the wood carving because I really learned how much detail I had to put in and how to start the machine and make it. My favorite project was the photoshop about the one were we got to write about the problems in this world because we really got to express ourselves. I think that this class would be very enjoyable if we got to do some photography because we did it last year and I really liked it.